tears: The pons receives sensations from facial skin and from the eyes, nose, mouth, and teeth, tells the jaw muscles to chew, moves the eyes from side to side, receives taste sensations from the side of the mouth, works muscles that control facial expressions, receives nerve impulses from sounds that enter the ears, causes secretions of saliva and tears. Stumptown: "Though in some ways Portland's appearance was pleasing, it had one feature which incited criticism and ridicule: stumps in the streets. A visitor in 1847 noted that 'The trees are cut down where the streets have been surveyed, but the stumps are left.'" E.E. Snyder, Early Portland: Stump-Town Triumphant. Portland, OR., 1970. p.43. researchers can: J.A. Hobson, J.A. Hobson, The Chemistry of Consciousness. Boston, MA., 1994. p.57. PGO: Ponto-geniculo-occipital waves. (Pons-geniculate nucleus-occipital cortex).The system is composed of generators that broadcast slow, high-amplitude waves. "These PGO waves in animals have been interpreted as 'a psychological correlate of the hallucinoid imagery' that humans visualize when they dream." J. Austin, Zen and The Brain. Cambridge, MA., 1998. p.166. the Latin Quarter: B. Miles, The Beat Hotel. New York, 2000. p.9. "Living in Paris, I was for a long time drawing a line around a few streets in the Latin Quarter, so that I could call a certain area 'mine.' A restaurant at the corner, a small bookstore, a laundry, a cafe succeeded each other when I was taking a walk and would give me some assurance through their presence at the points expected in advance." C. Milosz, "On Exile." Parabola, May 1993. pp.25-30. Columbia River Bar: "The oldtimers here, the men with ocean-polished faces who still speak with thick accents and congregate at the Sons of Norway Hall for secret rituals and snorts of chilled vodka with their vile-tasting lutefisk, refer to this area by its historical tag: the Graveyard of the Pacific. Justifiably, such talk makes them feel more alive. The Columbia River Bar has swallowed more ships, about 2,100 at last count, than any other location on the Pacific north of Mexico. 'Graveyard of the Pacific' is not some desperate booster slogan seized upon after all the canneries closed down and the money left town. The Chamber of Commerce hates it when locals bring up shipwrecks. They don't want to scare people. It's all under control now, they say." Timothy Egan, The Good Rain. New York. Alfred A. Knopf, 1990. p. 18.
nearing its end: "We had crossed the rainfall line again because the steep slopes of Kefallinia and Ithaca and barren except for scrub growth...cause may be demon woodcutters of past centuries, the subsequent severe erosion of soil, less rainfall, and the lack of conservation." H. Eoth, We Followed Odysseus. Port Washington, WI., 1999. pp186-7. rehearsed: "The existentialists call this strategy autoprojecting--imagining oneself in a better situation in the future and then pursuing this mirage. This is a loser strategy whether we achieve the goal or not, since it never brings what we expect from it. It leads to an inauthentic way of life..." S. Grof. In, E. Laszlo, Editor, The Consciousness Revolution. Shaftesbury, Dorset, England, 1999. p.14. a language: "Flanerie is a form of reading the street, through which people's faces, shop fronts, display windows, cafe terraces, trams, cars, trees become so many equally valid letters of the alphabet, which together constitute words, sentences, pages of an ever-new book." F. Hessel, Ein Fl�eur in Berlin. Berlin, 1984. p.145. Cirque Du Soleil: This unique circus began with street performers in Baie-Saint-Paul, Quebec, in 1982, and has grown to employ over 500 people. The big top seats up to 1,500.
there are innumerable: G.F. MacDonald, J.L. Case, C.D. Laughlin, and J. McManus, "Mirrors, Portals, and Multiple Realities." Zygon. March 1989. p.49. Koshare: "The clown's mystical liberation from ultimate cosmic fears brings with it a liberation from conventional notions of what is dangerous or sacred in the religious ceremonies of men." B. Tedlock. In, D. Tedlock & B. Tedlock, Editors, Teachings From the American Earth. New York, 1975.
his last tour: "In the spring of 1689 the Japanese poet Basho accompanied by his friend and disciple Sora set forth from old Tokyo on a nine month walk which took them through the backlands and highlands north of the capital and then west to the Japan Sea coast and along it until they turned inland again towards Kyoto. Basho recorded approximately the first half of his journey as a journal, which he worked on for about six years, and which finally became the Oku-No-Hosomichi, or Back Roads to Far Towns." C. Eshleman, "Test of Translation IV: Basho." In, C. Eshleman, Editor, Caterpillar Anthology. New York, 1971. pp. 74-9. David Rosen: Jungian psychiatrist, and the author of Transforming Depression: Healing the Soul Through Creativity (New York, 1996), and The Tao of Jung: The Way of Integrity (New York, 1997). what connects: Fibers originating from neurons in all major lobes of the cerebral cortex terminate upon the pontine nuclei, which, in turn, project to the opposite cerebellar hemisphere. These massive crossed fibers form the middle cerebellar peduncle, serving as the bridge that connects each cerebral hemisphere with the opposite half of the cerebellum. "our large moist brains": -Aristotle. Pill Hill: The hill in SW Portland on which Oregon Health Sciences University sits. and Nurses wear, really, how spooky it is. G. Snyder. From, "The Blue Sky." rhizomic system: "Let us summarize the principal characteristics of a rhizome: unlike trees or their roots, the rhizome connects any point to any other point, and its traits are not necessarily linked to traits of the same nature; it brings into play very different regimes of signs, and even nonsign states. The rhizome is reducible to neither the One or the multiple. It is not the One that becomes Two or even directly three, four, five etc. It is not a multiple derived from the one, or to which one is added (n+1). It is comprised not of units but of dimensions, or rather directions in motion. It has neither beginning nor end, but always a middle (milieu) from which it grows and which it overspills. It constitutes linear multiplicities with n dimensions having neither subject nor object, which can be laid out on a plane of consistency, and from which the one is always subtracted (n-1). When a multiplicity of this kind changes dimension, it necessarily changes in nature as well, undergoes a metamorphosis." G. Deleuze & F. Guattari, A Thousand Plateaus. Minneapolis MN.,1987 p. 21.
brain-stemmed hallucinations: "the stimulation that occurs during REM sleep comes from the brain stem, and specifically from the pons. The messages these cells send to the visual cortex are responsible for our hallucinations." J. A. Hobson, "Order From Chaos." In, R. Conlan, Editor, States Of Mind. New York, 1999. p.189. All around me: H. Melville, Mardi And A Voyage Thither. Evansten, IL.,1970. bringing back: P-M de Biasi, "Avant-propos." In, P-M de Biasi, Editor, Carnets de travail. Edition critique et g�n�tique. Paris, 1988. p.12. There was: W. Stevens. From, "Notes Toward a Supreme Fiction." 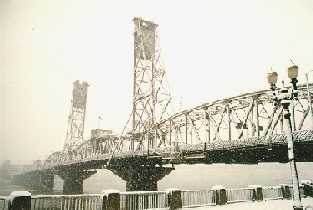 a bridge: Finished in 1973, the Fremont Bridge is Portland's newest bridge over the Willamette River. It weighs 6,000 tons and was lifted 170 feet . The tied arch span, 902 feet long, was floated into place. Trees: "Afferent fibers are of two kinds. There are climbing fibers, which branch extensively and appear to be in close contact with the dentritic tree of the Purkinje cells. Some of them may originate from a nucleus in the medulla called the inferior olive. The second category is known as mossy fibers. They give off some branches which make contact with the dendrites of the granule cells and others which appparently synapse with Purkinje cells. They may originate from the spinal cord, the inferior olive, or the pontine nuclei." H.L. Meltzer, Chemistry and Human Behavior. Chicago, 1979. p.96. anger: The pons has a pathway to the limbic system, especially to the amygdala, generating anxiety (nightmares) during REM (dreaming) sleep, the "fight or flight" response. It is often: A. Akhamatova, "Memories of Modigliani" Persea. Vol 1 No. 1, 1977. Modigliani: Amedeo Modiglini: July 2, 1884-January 25, 1920. "Like a prince, Modigliani was borne to P�re Lachaise cemetery in the plumed black carriage of the pompes fun�bres. A retinue including Zborowski, Derain, Brancusi, Lipchitz, Survage, L�ger, Soutine, Valadon, Foujita and Picasso followed the prince to his tomb. There were those among them who believed the Belle Epoque had truly ended that January of 1920 when Amedeo Modigliani was buried." W. Wiser, The Crazy Years: Paris in the Twenties. New York, 1983. p.9. Giacometti: Alberto Giacometti: October 10, 1901-Jan 11, 1966.
intoxicated: "An introxication comes over the man who walks long and aimlessly through the streets. With each step, the walk takes on greater momentum; ever weaker grow the temptations of shops, of bistros, of smiling women, ever more irresistable the magnetism of the next streetcorner, of a distant mass of foliage, of a street name. Then comes hunger. Our man wants nothing to do with the myriad possibilities offered to sate his appetite. Like an ascetic animal, he flits through unknown districts--until, utterly exhausted, he stumbles into his room, which receives him coldly and wears a strange air." W. Benjamin, "The Fl�neur." In, The Arcades Project. Cambridge, MA., 1999. p.417. One day: Text in black is by A. Giacometti, 1951. Photo of Alberto Giacometti; sculpture: Nu Debout III. eyes follow: "the cells that execute all our eye movements are located in the pons...The quickest way to activate 'eyes right' is to buzz the nerve cells or the right side of your pons." J.A. Hobson. The Chemistry of Consciousness. Boston, MA., 1994. pp 59;.88.
anima: "Anima consciousness not only relativises ego consciousness but also relativises the very idea of consciousness itself. It then is no longer clear when we are psychologically conscious and when unconscious. Even this fundamental discrimination, so important to the ego-complex, becomes ambiguous. Ego therefore tends to regard anima consciousness as elusive, capricious, vacillating. But these words discribe a consciousness that is mediated to the unknown, consciousness of its unconsciousness and, so, truly reflecting psychic reality." J. Hillman, Amina:An Anatomy of a Personified Notion. Dallas, TX., 1985. p.141. I'd be curious: M. Berman, "The Cybernetic Dreams of the Twenty-first Century." In, R.L. Loveless, Editor., The Computer Revolution and the Arts. Tampa, FL., 1989.
different chemicals: During waking consciousness, the pons is continuously secreting neurotransmitters called amines, mainly norepinephrine and serotonin. During REM sleep, these chemicals are drastically reduced, while different system of the pons, the cholinergic system, secretes acetylcholine, which, among other chores, inhibits motor action and moves the eyes. "We observed that dreaming was neither sleeping nor waking. It was obviously a third state of the brain. as different from (non-REM) sleep as sleep is from wakefulness." M. Jouvet, The Paradox of Sleep. Cambridge, MA. 1999. p.5. a realization: "Watch out for the nightmares!" -John Kielty Bell. Lower Macleary Trail: On June 20 1887, Donald Macleary donated 107 acres of forest to the city of Portland for a park, later incorporated into Forest Park. The Lower Macleary Trail is 1.4 miles, with a gain of 250 feet. Forest Park: More a forest than a park, spanning 5000 acres--acquisition of another 1000 acres continues to proceed--, Forest Park is the largest urban park west of the Mississippi. It was dedicated on September 25, 1948. John Muir: (1838-1914) Perhaps the most influential environmentalist, mountain climber, and nature writer in U.S. history, John Muir was born in Dunbar, Scotland. His family emigrated in 1849. Among his many accomplishments, Muir's trips to, and writings on, Yosemite, helped to save it as a national park. I hear footsteps: "Always and ever differently the bridge escorts the lingering and hastening ways of men to and fro, so that they may get to other banks and in the end, as mortals, to the other side." M. Heidegger, Poetry, Language, Thought. New York, 1971. p.153. Pontines Fibers of Rafe: (Background image.) "The (photographic) experiments were carried out using a tracer of retrograde transport (fast blue, 2%) or biodextran (bidirectional tracer). The photomicrographies were obtained with an optical fluorescence microscope (Axiophot, Zeiss). The work has been supported by Fapesp and FAEPA." N.C. Coimbra, M.D., PhD. http://www.epub.org.br/cm/gallery/gall_coimbra/fig11.htm. One must assume that this refers to the raphe system, which is located in the brainstem, near the midline of the reticular formation, whose neurons contain serotonin. it was thought: F. Capra, The Web of Life. New York, 1996. p.283. iron sculpture: The sculptor is Vern Luce. lung-gom-pa: Monks of old Tibet who were trained to run 48 hours, covering as much as 200 miles a day, without stopping. Their training consisted of years of seated meditation, visualization techniques, and exercises in breath control. Then the monks trained to literally follow a star by concentrating on it. In this way, they were able to lope over the land, almost flying, in a trance. Balch Creek: Named after Danford Balch, the first Oregonian to be convicted and hung for murder. pontificating: Pontiff: bridge-maker; the Pope. as a metaphor: D. Parsons, "Fl�neur Or Fl�neuse? Mythologies of Modernity." New Formations #38. Summer 1999. p.92. some cells: J.A. Hobson. The Chemistry of Consciousness. Boston, MA., 1994. New York, 1999. p.57. the amines: "The amines' role in the pons is to decide what to do with messages that are generated within the cells there. They decide to respond or not to respond, to record or not to record, to store or not to store." Ibid., p.59. Mt. Hood: At 11,235 ft. above sea level, Mt. Hood is the fourth highest mountain in the Cascade Range. Its base spreads over 92 mile. Its peak contains eleven glaciers. Suspended: The principle of the modern suspension bridge seems to have originated in a region of the Himalayas, where a bridge builder "threw over the chasm two parallel cables; from these he hung vertical suspenders made of thinner rope which carried the roadway platform...It represents a great advance in culture, for it is not merely an improvement upon natural bridges: it is actually a new idea." D.B. Steinman and S.R. Watson, Bridges and Their Builders. New York, 1941. p.20. neuroanatomy: J.C. Mazziotta, et al., "Atlases of the Human Brain." In, S.H. Koslow and M.F. Huerta Editors, Neuroinfomatics. Mahwah, NJ., 1997. p.255. in fire: Mt. Hood was born in the late Pleistocene Era. It's last eruption was in 1907. Scientist believe a major eruption is likely to occur during sometime the next 75 years. In May 1980, Mt. St. Helens, also visible from Portland, blew its top. Thomas Merton in Alaska: New York, 1989.
as electrical signals: J.A. Hobson, "Order From Chaos." In, R. Conlan, Editor, States of Mind. New York 1999. p.191. where even flowers say Hello. Yuan Chen was sitting in the Western Court. -J.Weishaus. From, "Five Spring Poems From Po Ch�-1." we'll recall: As brain tissue has no feeling, most operation are conducted with the patient awake. "In one such operation, the patient jerked her head backwards causing the surgeon's probe to enter some three centimeters into the pons. She immediately became unconscious for about ten to fifteen seconds and later reported that her past life had flashed before her." G.R. Taylor, The Natural History of the Mind. New York, 1981. p.75. Anthropologists: See, J. Clottes and D. Lewis-Williams, The Shamans of Prehistory. New York, 1996. Another approach are the experiments in trance-postures carried out by Felicitas D. Goodman. (F.D. Goodman, Where the Spirits Ride the Wind. Bloomington, IN., 1990.) See her interpretation of the "well scene" at Lascaux, pp. 20-3.
ordinary dreams: "In the famous well scene in the Lascaux cave, painted 18,000 years ago by our Cro-Magnon ancestors, we see a sleeping man with his arms outstretched, apparently sleeping soundly, and with a full erection. A bird is perched beside him. In front of him are a wounded bison, with its entrails hanging out, and a broken spear. According to some prehistorians this is a scene related to shamanism. But I can think of another interpretation. 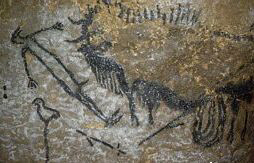 The association of erection or prostrate figure with a bird might provide a clue to the interpretation of this cave painting. I assume that our ancestors were capable of observation and that they had already noticed periods of erection during the night, in infants as in old men. Maybe they had related these intuitively to dreaming." M. Jouvet, The Paradox of Sleep: The Story of Dreaming. Cambridge, MA., 1999. p.170. O. Broumas. From, "Landscape With Poets." without blinking: Pontine cells cause the eyes to move by exciting occularmotor cells in the brainstem. In addition, blinking hard is a technique I've used for waking up from a nightmare. it's the ego: Speaking of his study of survivors of jumps off the Golden Gate and San Francisco-Oakland Bay Bridges, David H. Rosen "began to think about what I termed egocide. The survivors of suicide had really meant to annihilate themselves. However, what they did instead was to destroy (or sacrifice) their egos. Their conscious ego identities died--that is, they symbolically killed their former perspectives of themselves and of life." D.H. Rosen, Transforming Depression: Healing the Soul Through Creativity. New York, 1996. pp.64-5. baptized: Pons stems from the same root as pontiff. Pontifex means "bridge-builder." St. Benezet, 12th Century founder of an order of monks called Fratres Pontifices, "Brothers of Bridges," is the patron saint of bridge-builders. To these monks keeping up roads and bridges was a spiritual task. a tramp: "Bridges gather to themselves an underside, they have an underworld. These are places of stillness and exile." P. Bishop, "The Soul of the Bridge: A study in Anima Mundi Psychology." Paper delivered at Inaugural Conference of the London Convivium for Archetypal Studies. London, England. June, 1987.